OK, it’s summer 2010. Oil continues to spill into the Gulf of Mexico, and we still spend billions of dollars to feed our ever-increasing appetite for petroleum, all while pumping millions of pounds of carbon emissions into the atmosphere. Isn’t it about time we embraced some alternatives? It’s time to get on a bike, a train, or a bus, St. Louis! 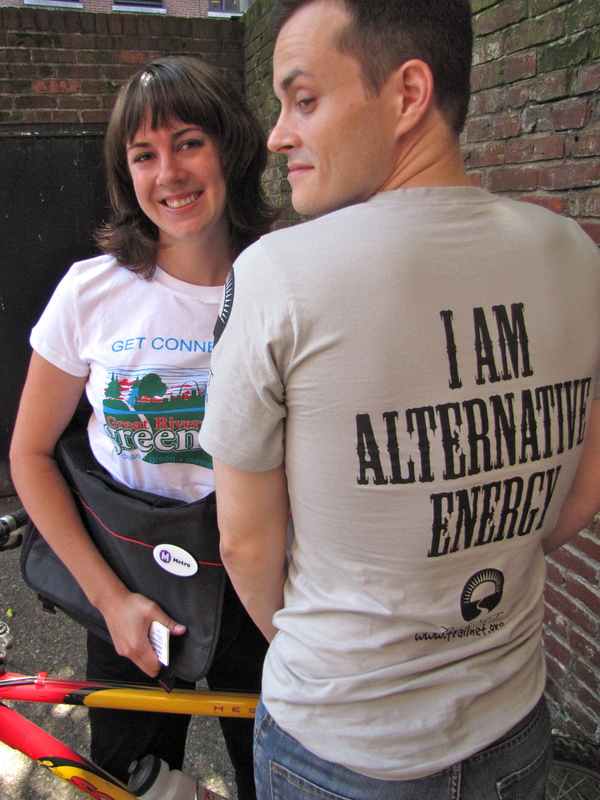 Courtney and Arch Observer's Jim Barnthouse with t-shirts and gear from Trailnet, Great Rivers Greenway, and Metro. Who needs cars with faces like these? Thursday, June 17, is National Dump the Pump Day. Sponsored by the American Public Transit Association (APTA), Dump the Pump Day is designed to focus on conserving fuel, reducing the environmental impact of everyday commuting, and reducing America’s dependence on foreign oil by finding alternatives to the use of personal vehicles. Walk. Bike. Take transit. It’s a great time to get out of your car and explore your neighborhood, try transit, or bike to work. Did you know bike commuters lose an average of 12 lbs during their first year of bike commuting? Or that public transit users walk an average extra 20 minutes a day over auto commuters? All over the country, transit and bike commuting is increasing as people realize the benefits of staying away from traffic. Entries will be accepted through Monday, June 28. Prizes will be awarded July 6. 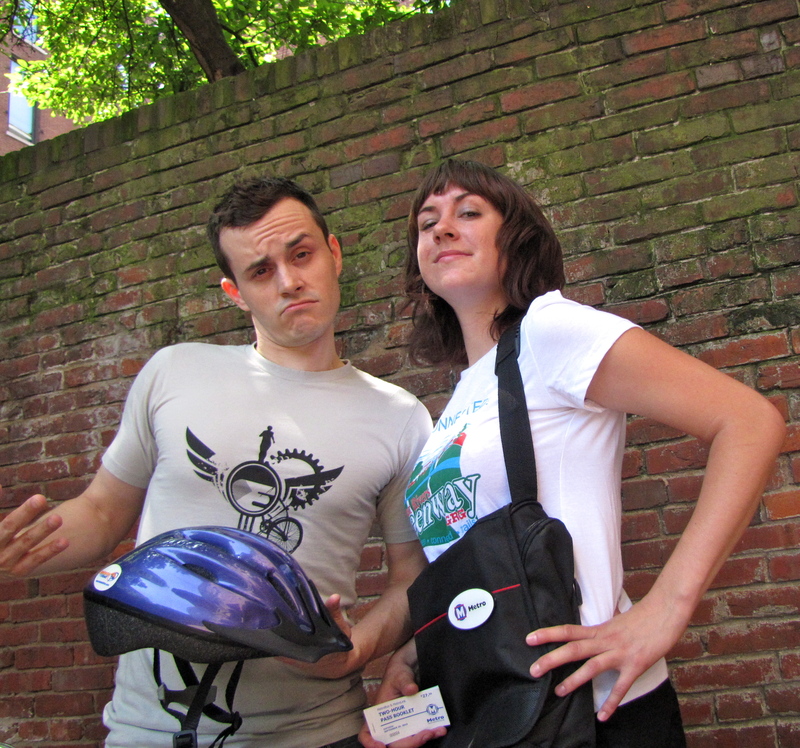 Click here to register to win some of the awesome gear from local organizations promoting alternative transportation (as shown by myself and Arch Observer Jim Barnthouse). I hear Jim Barnthouse is alternative energy. Commuters choosing public transit on June 17 may also be greeted and thanked personally by members of Metro’s leadership team, employee volunteers, and even cheerleaders from North East Middle School in St. Louis. Because you deserve some recognition and thanks for dumping the gas pump. Each year, the use of public transit in the U.S. saves 4.2 billion gallons of gasoline by eliminating the need for 900,000 automobile fill-ups each day. Commuters who switch to public transit can reduce the carbon emissions of their personal vehicles by 20 pounds a day, or 4,800 pounds a year. In addition to helping save the environment, families that use public transit and live with one car can save an average of $9,000 a year. For every $1 invested in public transportation infrastructure, $4 is generated in economic returns to communities. June 17: National Dump the Pump Day. Step away from the car, and spend the day being the alternative. This is easily the coolest thing since sliced bread. No scratch that bread doesn’t even come close. We all need to dump the pump every day. Robert, don’t turn into a psychic. They lie too much. Tell the truth. Some people who try dumping the pump on June 17th may find that public transit is better or they might not. You never know. Somehow the only thing that is really stupid about this is that the bus drivers and/or train operators aren’t allowed to mention the connecting bike trails and I think that is a stupid rule. Forest Park is LITTERED with trails. In Illinois, there is a part of MetroLink that connects the College station in Belleville with the Belleville station just outside downtown Belleville. The River Des Peres trail connects the Shrewsbury station with the Hampton/Gravois transit center. Although I found out that Metro is getting Trolley buses (rubber-tired trolleys) to run on route #99 and at the restoration meetings I went to, I saw no word about the purchase of trolley buses. Secrecy is what makes it hard for motorists to dump the pump. I found out about the #99 Downtown Circulator being changed to the #99 Downtown Trolley just yesterday. They could have brought it up and posted it in the minutes and/or on the ser vice changes that go into effect June 28th. The Downtown “Trolley” is just the #99 Downtown Circulator wrapped to look and be branded as a trolley, through a partnership with downtown organizations. It is not a new purchase. The #99 will have some route alterations, which was part of the original proposed changes. It will now serve City Museum and Market Street. A multi-modal approach to transportation is good, and necessary, in this region. But Dump the Pump Day is about trying taking different approaches to transportation, such as using transit. Using different modes of transportation, including transit, biking and walking, helps us save money on gas and infrastructure, and encourages better health.